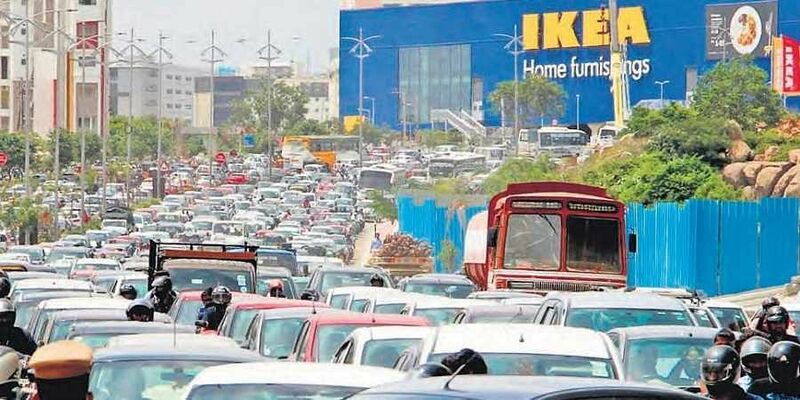 Are the roads around Hitec city ready to handle the surge in traffic following the launch of furniture retailer IKEA? It did not seem so on Thursday. HYDERABAD: Are the roads around Hitec city ready to handle the surge in traffic following the launch of furniture retailer IKEA? It did not seem so on Thursday. Despite a five-lane wide road stretching from the Biodiversity Junction up to the IKEA showroom, traffic moved at snail’s pace all through Thursday. A GHMC survey conducted earlier points out that over 14,000 vehicles pass through the Hitec city main road every hour. Interestingly, the home furnishing chain is expecting a footfall of over 20,000 per day over the week, and this is expected to rise on the weekends. The situation was worsened due to parking confusion that ensued, forcing traffic police to issue a an advisory on Thursday evening. The in-house parking capacity of IKEA, as per the traffic police, is somewhere around 700. “As per their claim there would be somewhere around 20,000 to 30,000 visitors throughout the day. If that is the case, parking will be an issue. They have arranged for some external parking areas to combat the initial pressures of parking, but even then public out of ignorance and less information may come to the main building,” said Vijay Kumar, DCP Traffic, Cyberabad. Even these three external parking points at Indira Nagar, Nanakramguda and ITC Kohenur have to meet the traffic congestion at Hitech city road. The other roads leading to IKEA — from Mindspace and Lemon tree — showed peak traffic levels due to office rush hour. Experts, however, said the solution to the traffic issue, lies only in pumping in more public transport. The #ikeahyderabad madness. Just can't figure out what domestic necessities are so pressing that only IKEA can solve and has to solve today. Apparently, there are over 35, 000 of these urgent needs. That egg beater and that bedside lamp are so worth this paralyzing traffic hell.